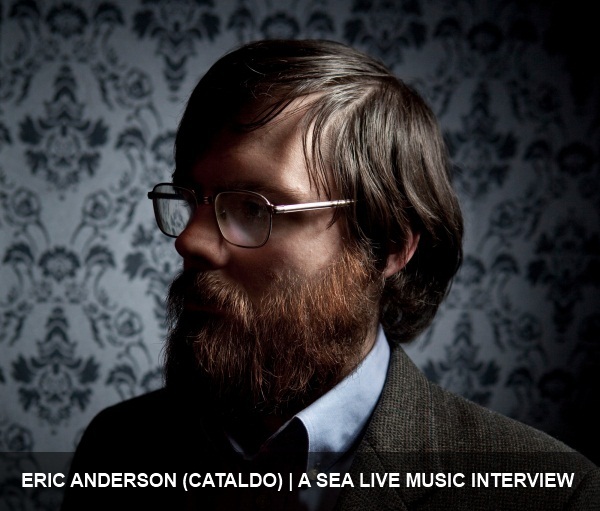 Since relocating to Seattle in 2008, Eric Anderson of Cataldo has quickly become one of our favorite local musicians. His ability to craft (sometimes painfully) honest folk-tinged songs infused with clever wordplay and a strong dose of pop sensibilities has made his latest album Prison Boxing a regular musical accompaniment to our (sometimes mundane) daily routines. In advance of Cataldo’s set at The Croc tonight, Eric was kind enough to answer some questions about Cataldo’s evolution, his new life in Seattle and much more. After reading the interview, be sure to watch Christian Sorensen Hansen‘s excellent video for Deep Cuts (below). If you’d like to learn a bit more about tonight’s show with Sounds Major, be sure to check out our short preview from earlier today. How would you say your approach to songwriting or maybe just the process of writing, arranging and recording has changed over the years? It’s changed a great deal. The biggest change with “Prison Boxing” was the inclusion of bass and drums on almost every song. Our first two records are, for lack of a more accurate adjective, “folkier.” While occasionally quite ornately orchestrated they’re mostly built around a voice and acoustic guitar. This is, relatively speaking, a rocker. We also used recording studios for a couple days which was a new experience. I keep a notebook of lyrical ideas (analogies, images, cool words, etc), little pegs I try to jam into musical holes. As far as the tunes I’ve historically started with a guitar, banjo, or piano. Beginning with this past record I have been writing melodies without tying them to a rhythm instrument early in the process. Filling those out in ways that surprise and excite me has been increasing challenging and rewarding. Growing disenchanted with strumming an acoustic guitar makes sense given I’ve been doing that more or less exclusively for 8 years and three records. When we’ve written about Cataldo before we made the statement that your sound falls “somewhere between The Weakerthans and The Decemberists.” How far off were we in your mind? I have not heard The Weakerthans but you’re in the right building with The Decemberists comparison. Pop music which is worth listening to because of the well-crafted lyrics. What musicians rank among your favorites for skill with lyrics and wordplay? Smog/Bill Callahan, The Magnetic Fields, The Mountain Goats. Compelling after years of listening. Songwriters who have made me excited about the unexplored possibilities of a verse, chorus, and the occasional bridge. Your recent tour dates show a connection to The Long Winters and/or the original Harvey Danger lineup. How did you first come to meet John and Sean? I met John at a benefit we played for Patty Murray. He was generous with his time and advice for no good reason. Not long after we opened for The Long Winters where he was unexpectedly joined by Sean Nelson. Afterwards I shook Sean’s hand, said, “I never thought I’d see that,” and made my way out of the club. He contacted me not long after and we put this show together. I am proud to be a part of the northwest’s lineage of, as Sean recently called it, “brainy feelings music.” It’s shaped me as a writer and person so I am understandably excited and honored get to play with them. What should people expect from your set this Friday? Slightly tweaked band. A John Cale cover. Back to back guitar noodling. How has Seattle treated you since you first moved here? I moved to Seattle in summer 2008. I was terrible for a year as my relationship imploded and I ran out of money. The next year I found a job scooping ice cream and things steadily improved from there. As of this moment I count myself supremely lucky for my friendships and experiences in Seattle. Does Seattle feel like a permanent home or will the next Cataldo record be released in another city? I have a good job, good relationship, and good band. I won’t be moving soon. What are your favorite venues as a perform and which would rank highly on a list as concert-goer? I spent some time in Laura Veirs’ band and had the privilege of playing many cool places. The Ryman Auditorium in Nashville, in addition to its amazing history, feels simultaneously huge and intimate. Union Chapel in London pulled off the same trick. It was special to be in both rooms. As far as local rock clubs–Neumos and The Showbox have great sounding stages. The Sunset and Tractor Tavern always give me a warm feeling inside. I recently got to do a little singing with Hey Marseilles with the Seattle Symphony at Benaroya. That stage felt unnervingly accurate which, I suppose, is what you want with world class musicians on it. Any room is as great as the band on stage. More touring hopefully. Start the next record. Perfect my tuna salad. Deep Cuts from Christian Sorensen Hansen on Vimeo.